Today’s technique has been borrowed by the extremely talented Jennifer McGuire and in particular this post here. I wanted to try this same technique with some Penny Black supplies and it worked so beautifully. First up I blended some Cracked Pistachio, Wilted Violet and Worn Lipstick Distress Oxide inks onto some watercolour card stock. Did I mention that these babies blend like butter (to borrow a catch phrase from Laura Bassen)? I took the Penny Black Hypnotic stencil and sprayed it with a fine mist of water. I placed this face down onto the blended panel and let it sit for 5 mins or so while it did its thing. 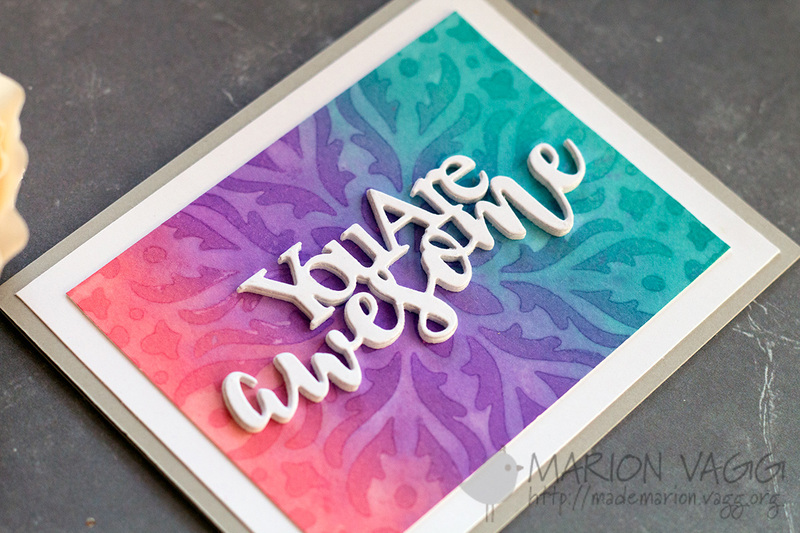 The sentiment is from a Penny Black Creative die set called Awesome. I borrowed a technique that Therese Calvird uses regularly where she die cuts the sentiment from fun foam and then adheres the card stock sentiment over the top. I don’t know why I haven’t tried it before, but it worked a treat too. I hope you are having a wonderful day. Hello! It’s been quite sometime since I last posted. There has been good reason for my absence – My hubby and I went on a little vay-cay (without the kids mind you) to Canada! We had an awesome time and loved experiencing such a beautiful country. I won’t bore you with details here, but you may have seen a few photos I put up over on Instagram (@marionvagg). 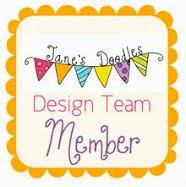 Today I have some playful tags to share with you, using a variety of Jane’s Doodles stamp sets. You can see them also on the Jane’s Doodle blog here. 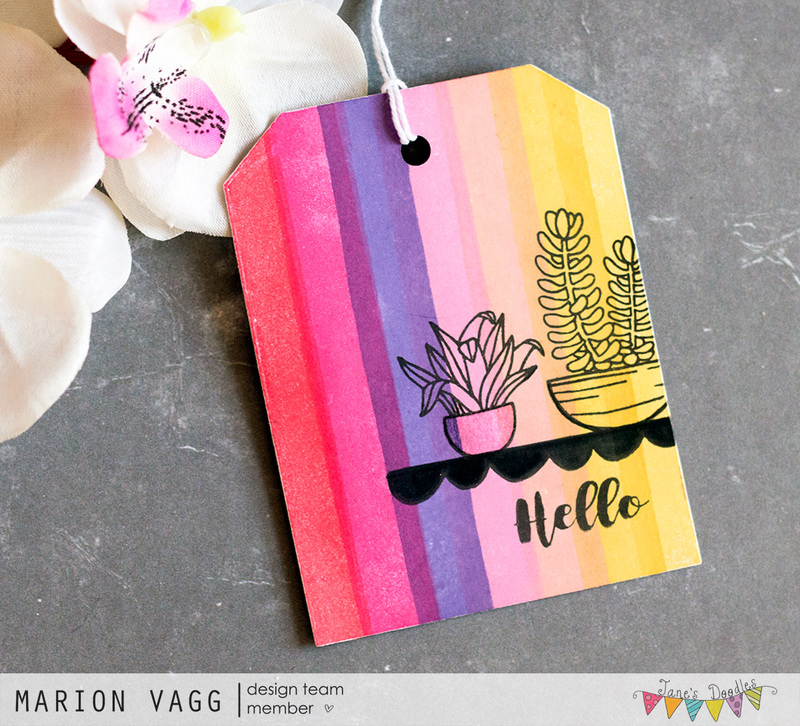 I created the stripes in the background using the Stripes and Dots stamp set and a variety of ink colours. I overlapped the stripes, which created additional colours. 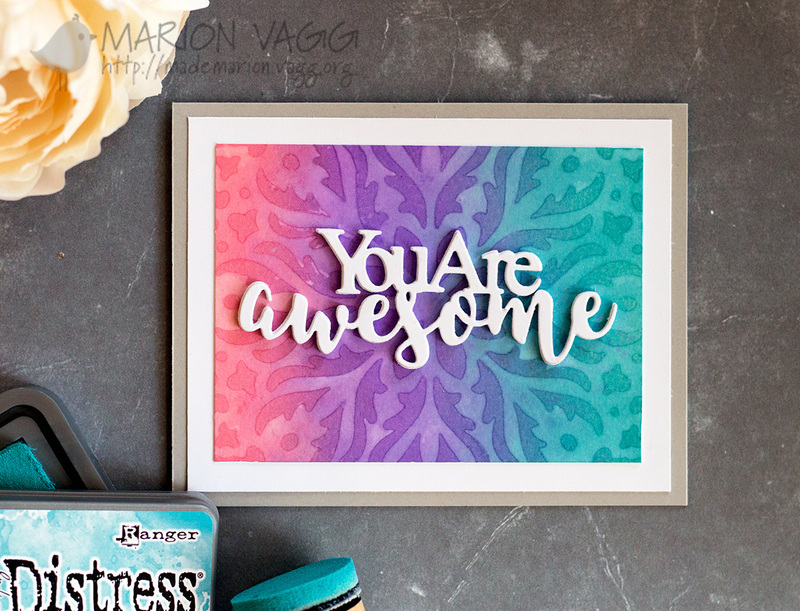 The shelf was stamped from the LOVE stamp set – it is actually a scalloped border, but I coloured it in with a black marker and it became a shelf! 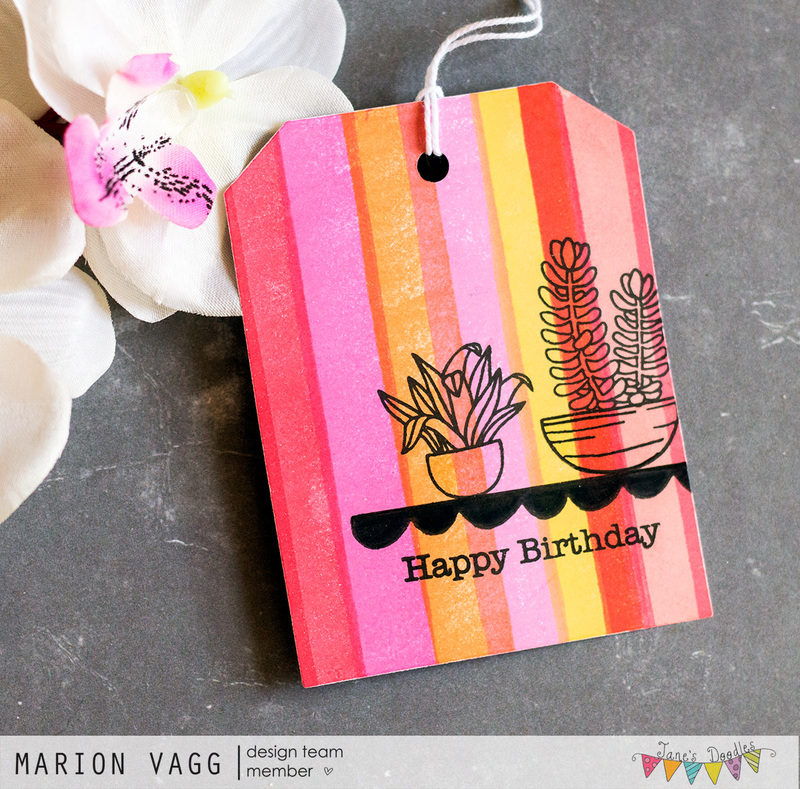 The plants are from the Plants and Cactus stamp sets. 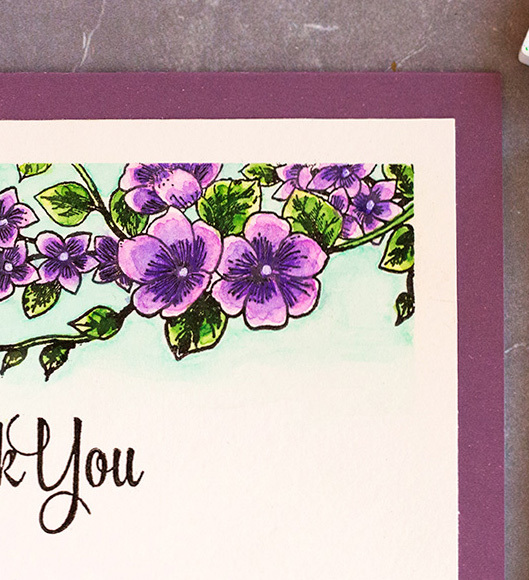 It’s my turn over on the Simplicity at its Best blog today where I’ve created a simple thank you card with some masking and water colouring. I hope you’ll head on over for the full reveal. Go here. Today I have a special anniversary card that I made for my Aunt and Uncle who have just celebrated their 50th Wedding Anniversary. 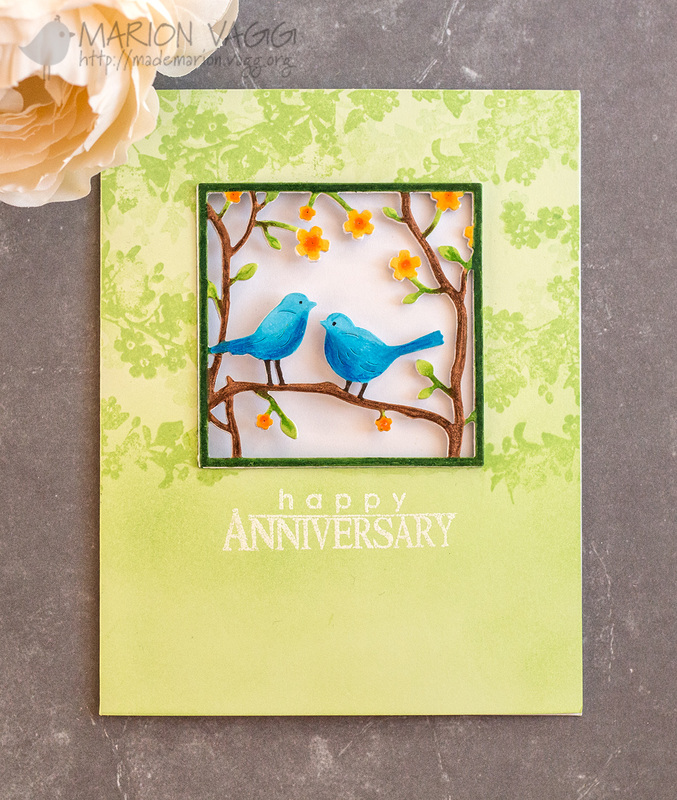 Such a special milestone to celebrate, and I love how this window card turned out. I die cut several layers (five I think) of the Penny Black layered scene from white card stock and adhered them together. Before adhering the top layer, I coloured it with a mixture of Copics and Prismacolor pencils. I stamped some very subtle leaves from the Penny Black You + Me stamp set in green ink (first and second generation stamping) onto a green card base to add some interest. 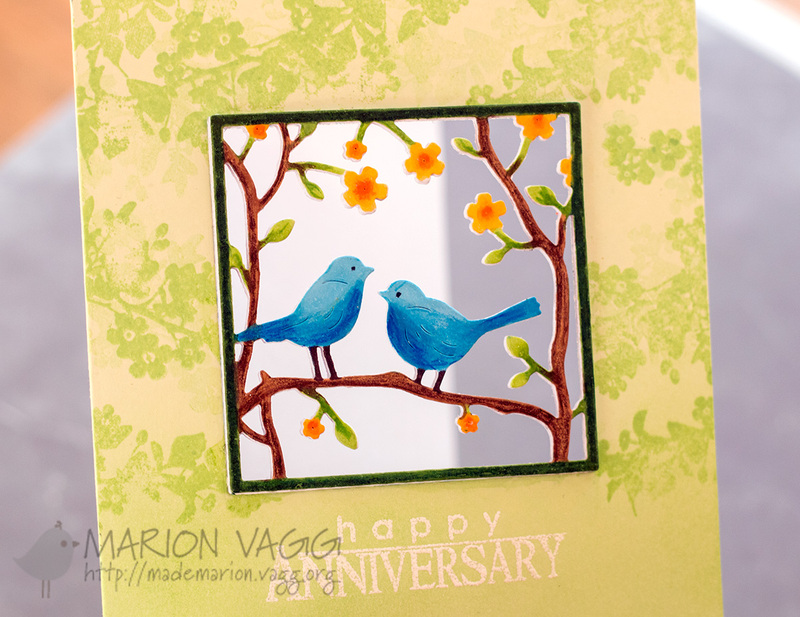 I then used the same die cut and created a window in the front of my card and adhered the bird scene into the window. I did this by adhering it with a small amount of washi tape, that is visible on the back side of the window, but it did the trick of securing the window in place. The sentiment is from the same set as the leaves and was white heat embossed. I felt the sentiment wasn’t visible enough, so I blended in some green ink over the sentiment and on the bottom half of the card. This photo shows the window element of the card better.